We'll soon see a battle between classic versus contemporary! 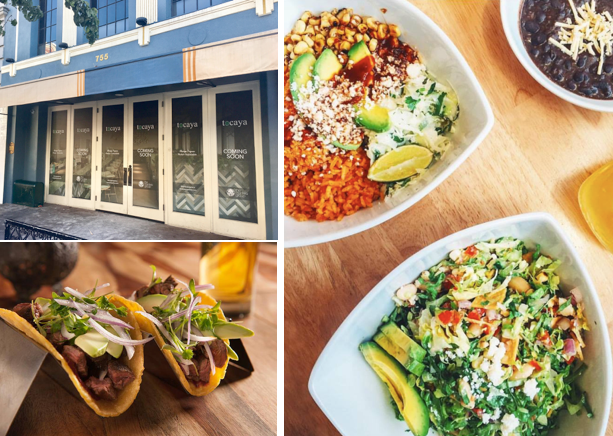 Coming in right down the block from downtown San Diego's incoming, traditional street taco spot, Tacos El Gordo, is a huge modern-Mexican organic restaurant. The Madera Group recently closed Cake Nightclub at 755 5th Avenue in the Gaslamp and will use the 6,000 square foot space for another one of the company's concepts - Tocaya Organica - which currently has two branches in Los Angeles with another planned for Miami. Tocaya Organica is an offshoot of the more-upscale Toca Madera modern-Mexican concept from The Madera Group, which at one point the company intended to implant into the space at 751 5th Avenue under Cake. Tocaya's menu features salads, tacos, bowls, burritos and wraps handmade daily by a chef-trained team with all organic ingredients, farm-fed and free-range meats, and sustainable seafood. There is also a separate vegan menu. The eatery is anticipated to open in early 2017. Owned and operated by Amrou Manaseer and Tosh Berman, The Madera Group is a team of "artist-engineers dedicated to realizing the evolution of hospitality." Founded in 2013, the company owns and operates a portfolio of luxury hospitality venues across the U.S. with plans to expand to Los Cabos Mexico next year. For more information on Tocaya Organica, visit tocayaorganica.com.